Figure 1. Thumbnails demonstrating atrophic nail plates with longstanding ridging, distal clefting and lamellar peeling. The left thumbnail also has a triangular scar extending from the proximal nail fold (pterygium). Figure 2. Biopsy of the nail bed showing a prominent lymphocytic infiltrate producing an increased blue granular zone in the epidermis and a thick keratin layer representing the dystrophic nail. A 58-year-old woman presented with a three-year history of progressive thinning and longitudinal splitting of her fingernails. Her thumbs were also partially covered by a web of tissue (pterygium) which extended from the proximal nail fold across the nail bed (Figure 1). The main elements seen on clinical examination of this woman&#39;s nails were atrophy, longitudinal ridges, distal splitting, lamellar peeling, pterygium formation and a violaceous discolouration of the proximal nail fold and nail beds. Atrophic nail plates are the result of reduced production of the nail keratin by the nail matrix (root). This can be caused by developmental abnormalities of the matrix, infiltrates (such as those produced in sarcoidosis or amyloidosis), or immune-mediated lymphocytic destruction of the matrix, which occurs in conditions such as lichen planus, lupus erythematosus and graft versus host disease. Longitudinal ridges are accentuated in atrophic nails and correspond to the grooves of the nail bed. The ridges may lead to longitudinal splits and distal clefts in the nail plate. Distal splitting and lamellar peeling is often caused by physical and chemical injury to the nail plates, but is accentuated in thin atrophic nails. Pterygium formation is a result of scarring of the nail unit and subsequent adherence of the proximal nail fold to the nail bed. It can be seen in a range of conditions, such as trauma, bullous diseases (for example, epidermolysis bullosa), ischaemia and infection, or may be the result of lymphocyte-mediated immune destruction of the nail unit. Lichen planus of the nails is the diagnosis in this case, based on the clinical findings and the histopathology. 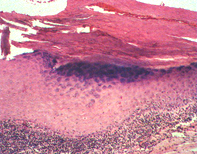 A longitudinal biopsy through the nail bed and matrix showed a dense lymphocytic infiltrate, which extended into the base of the epidermis, producing an expanded, dark blue, granular layer (Figure 2). There was also increased surface keratin representing the dystrophic nail plate. A useful clinical clue was the violaceous discolouration of the proximal nail fold and bed. Other signs of lichen planus that should be sought include the classical pruritic polygonal violaceous papules, a lace-like buccal rash and scarring alopecia. For isolated nail involvement, intralesional triamcinolone acetonide (10 mg/mL) can be injected into the nail matrix and bed every four weeks for two to three months. In individuals with extensive nail disease, prednisone 0.5 mg/kg given on alternate days for three to six weeks may be successful. Oral acitretin in low dose has also been used. The lichen planus may recur. Lichen planus of the nails is characterised by atrophic nail plates associated with a violaceous discolouration of the proximal nail folds. This article was first published in Modern Medicine of Australia in October 1997. It was reviewed and updated in July 2011.